This FREE utility is for fast and accurate typing in any application. You effort will be reduce and you will be free from the pain of laborious typing. As you type in any application, suggestion window opens to show you the possible words you are typing, then, with one key stroke; it automatically completes the word for you. This utility is intelligent enough to learn the words you type. No need for any installation or setting. I have received few suggestions over a period of time and included to help you better. · No cost – completely FREE. · Universal Compatibility: Works with virtually all programs. · Auto-Learn: Learns unknown and recently typed words. 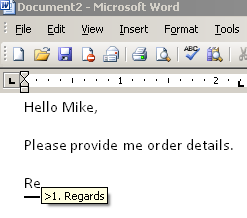 · Auto-Expand: Expands shorthand to full text. · Portable: Runs from a USB memory device. MVC is a framework methodology that divides an application implementation into three component roles: models, views, and controllers. Models in a MVC based application are the components of the application that are responsible for maintaining state. Often this state is persisted inside a database (for example: we might have a EmployeeClass that is used to represent order data from the Employee table inside SQL). 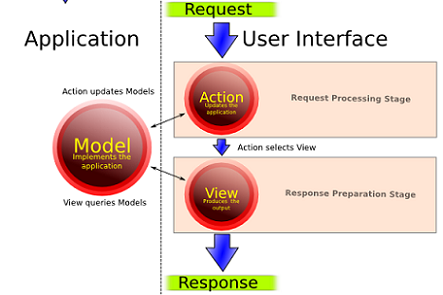 Views in a MVC based application are the components responsible for displaying the application’s user interface. Typically this UI is created off of the model data (for example: we might create an Employee [Edit] view that surfaces textboxes, dropdowns and checkboxes based on the current state of a Employee object). Controllers in a MVC based application are the components responsible for handling end user interaction, manipulating the model, and ultimately choosing a view to render to display UI. In a MVCapplication the view is only about displaying information – it is the controller that handles and responds to user input and interaction. 1. It provides a clean separation of concerns between UI and model. 2. UI can be unit test thus automating UI testing. 3. Better reuse of views and model. You can have multiple views which can point to the same model andalso vice versa. 4. Code is better organized. The MVC pattern helps you create applications that separate the different aspects of the application (input logic, business logic, and UI logic), while providing a loose coupling between these elements. The pattern specifies where each kind of logic should be located in the application. The UI logic belongs in the view. Input logic belongs in the controller. Business logic belongs in the model. This separation helps you manage complexity when you build an application, because it enables you to focus on one aspect of the implementation at a time.For example, you can focus on the view without depending on the business logic. 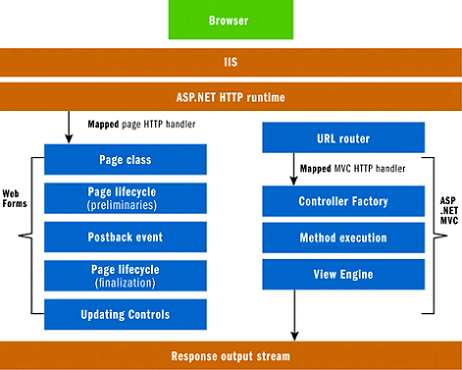 In addition to managing complexity, the MVC pattern makes it easier to test applications than it is to test a WebForms-based ASP.NET Web application. For example, in a Web Forms-based ASP.NET Web application, a single class is used both to display output and to respond to user input. Writing automated tests for Web Forms- based ASP.NET applications can be complex, because to test an individual page, you must instantiate the page class, all its child controls, and additional dependent classes in the application. Because so many classes are in instantiated to run the page, it can be hard to write tests that focus exclusively on individual parts of the application. Tests for Web Forms-based ASP.NET applications can therefore be more difficult to implement than tests in an MVC application. Moreover, tests in a Web Forms-based ASP.NET application require a Webserver. The MVC framework decouples the components and makes heavy use of interfaces, which makes it possible to test individual components in isolation from the rest of the framework. System.Web.Mvc.Ajax namespace contains classes that support Ajax scripts in an ASP.NET MVC application. The namespace includes support for Ajax scripts and Ajax option settings. System.Web.Mvc.Html namespace contains classes that help render HTML controls in an MVC application. The namespace includes classes that support forms, input controls, links, partial views, and validation. 5) Instantiate and render view. Hope you will find this helpful. Feel free to provide your comments.